In Vanuatu Canterbury has 100% of two Prospecting Licence’s on Malekula (PL’s 1836 and 1837), plus five PL applications on Malekula and Espiritu Santo. Sporadic exploration in Vanuatu has encountered widespread epithermal gold-silver and porphyry copper-gold mineralisation, and Canterbury’s tenements and applications cover many of the key historical prospects. Strategic tenements have been established over a series of historical gold prospects, and Canterbury has completed several mapping and sampling programs. Our applications include the Fundor and Tafuse prospects where historical exploration has identified exciting ‘drill-ready’ targets. Porphyry copper and epithermal gold-silver style mineralisation have been identified on both Espiritu Santo and Malekula. Porphyry style alteration and mineralisation occurs in a western belt whereas epithermal environments occur in a spatially separate belt to the east. Epithermal mineralisation on Espiritu Santo is hosted within the Central Santo Terrane where it appears to be related to subsidiary faults to the terrane boundary faults. 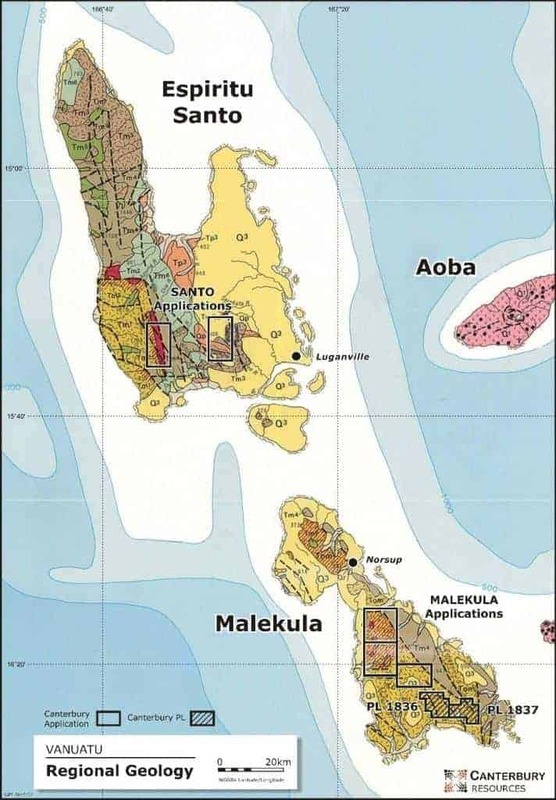 Gold-silver-base metal mineralisation on Malekula occurs in the south of the, island with the main prospects at Taoran and Amethyst being epithermal in nature and related to west dipping thrust faults. Exploration by Canterbury is at a relatively early stage. Field work has comprised several reconnaissance mapping and sampling campaigns focussed on the Taoran, Amethyst and Barius prospects where encouraging historical results have been reaffirmed by Canterbury. The Taoran Prospect in PL1836 comprises gold-silver mineralisation hosted by numerous blue-clay pyrite shear zones and brecciated quartz veins which strike north-northwest and dip steeply east and west. The prospect was discovered in late 1985 by United Resources Vanuatu Ltd (“City Resources”) that drilled three holes parallel to the mineralised trend in 1986. Best intersections were 12.3m at 3.3 g/t Au (forty-gram area), 4.0m at 3.0 g/t Au (central stockwork area), 17.8m at 1.4 g/t Au (silica replaced limestone area). In 1993, ISCOR drilled twelve holes to assess a soil geochemical anomaly, with best results being 2m at 8.6 g/t Au (galena-sphalerite-quartz vein and breccia infill shear zone) and 13m at 1.5 g/t Au (weakly silicified and quartz veined andesite). The Amethyst Prospect in PL1836 was originally identified from amethystine quartz float in rivers. It has been evaluated by several explorers, including City Resources (1986-1987) that recorded bench sampling results of 5 m at 7.0 g/t Au, 5 m at 7.5 g/t Au and 5 m at 6.4 g/t Au, and Vanaust Minerals Ltd (1991) that drilled nine shallow holes in a small area proximal to a trench with exposed amethyst veins. The Vanaust drilling encountered eleven narrow gold bearing intercepts (>1.0 g/t Au), albeit core recovery was reportedly poor. The Barius prospect in PL1837 comprises a 2km long northwest-striking alteration zone which coincides with a magnetic low and a potassic radiometric anomaly. Gold-silver-zinc mineralisation is associated with clay alteration, brecciation and quartz vein stockworking. Canterbury has assessed historical data for its various application areas, identifying several promising targets. At Fundor on Espiritu Santo, base metal-gold mineralisation is hosted by volcanoclastic sediments and limestone within a 1200m by 900m alteration envelope comprising pervasive argillic alteration and propylitic-phyllic alteration. Several styles of base metal and/or gold mineralisation are noted. The Tafuse prospect, located 1.5km northwest of Fundor, is localised by the same northwest trending structure. Epithermal style gold-silver-basemetal mineralisation occurs within a 1000m by 500m alteration envelope within volcanics that are intensely hydrofractured and argillically altered. Canterbury considers the geology, structural setting and styles of mineralisation on Espiritu Santo and Malekula analogous to the gold and base metal deposits and prospects of the Hauraki province in the Coromandel Peninsular of New Zealand. The Hauraki Province has been a gold-silver-base metal producer since the mid-1800s and has produced more than 10Moz gold. Modern exploration since the early 1980s has led to a comprehensive understanding of deposit characteristics and controls on mineralisation. Canterbury proposes to apply this knowledge in its exploration strategies in Vanuatu. 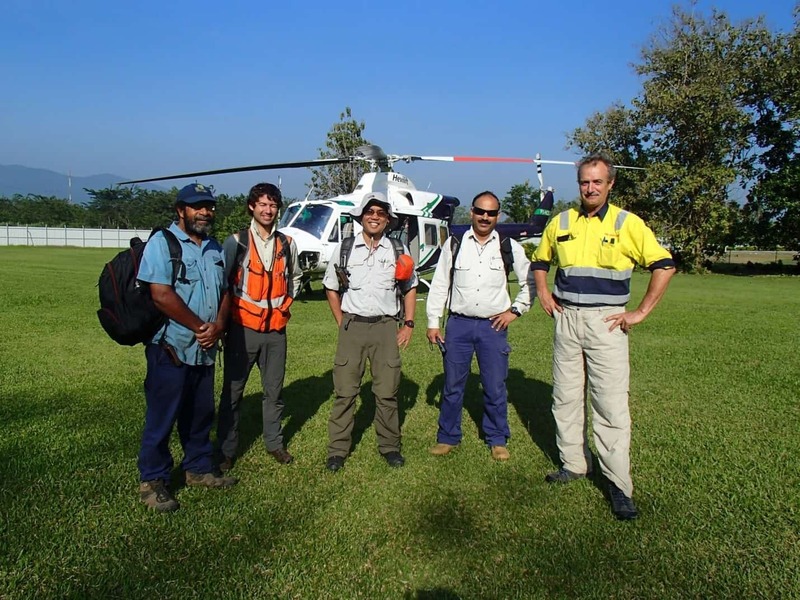 Canterbury Resources Ltd is an emerging resource company focused on exploration opportunities in the southwest Pacific - a region renowned for hosting world-class copper and gold deposits. 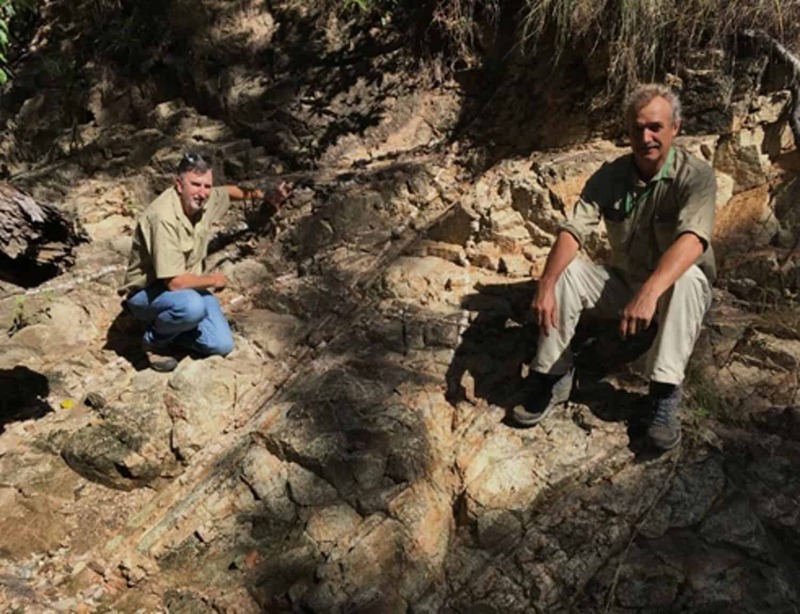 Canterbury has established a strong portfolio of projects with large scale potential in well-endowed mineral regions, and is applying modern exploration expertise to systematically assess them. © 2019 Canterbury Resources. All rights Reserved.